Hi, bloggers. Today brings post #6 in my How to Blog Party series, which is written for new and experienced bloggers...lots of tips and tricks for joining and hosting a blog/link party. You can click here to start at the beginning of the series and see a round-up of all the posts so far. 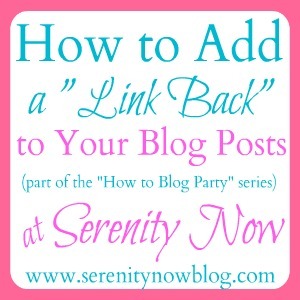 Last week, we talked about how to choose a post to add to a link party. Today's topic will explore what a link back is and how to add one to your blog post when you link it up to a blog party. If you're new to blogging and blog parties, you may have seen Suzy Blogger request that people joining her blog party add a "link back" to their posts in order to participate in her blog party. You probably thought, "What is she talking about?!" What is a Link Back? Where do I add a Link Back in my post? Link backs are normally found at the end of a post. 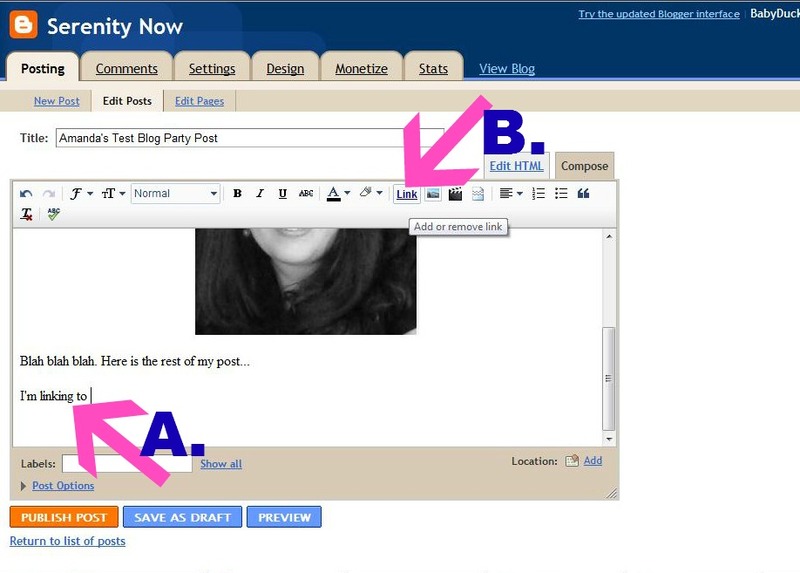 Most bloggers who want to join a blog party add a quick "Linking to ____" (the blank being a link to the site they have added their post to) at the end of their post. How do I know if I'm supposed to add a Link Back? Before you link up to a blog party, check and see what the hostess' guidelines are. Any blogger who is serious about growing her blog, SEO (Search Engine Optimization), and networking with others will ask for a link back. The omission of link backs in party posts is so prevalent in the blogosphere these days that many bloggers (myself included) look for a link back in a post before they will agree to feature a person's work. Adding a quick link back to your post takes no time at all once you know how to do it correctly. There are also many ways that bloggers add link backs, but you should know that not all of them are well-received by party hostesses. I'll show you the easiest and most accepted way to Link back today! 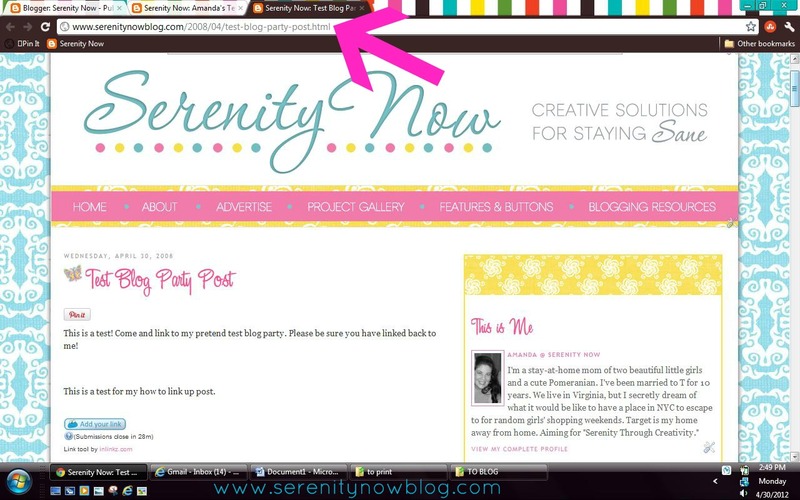 I'm using the older Blogger interface, but it's pretty much the same steps with the new Blogger. For most blogs, you can click on the title of the post, and the new URL for the specific post (called a "permalink") will pop up. It's the main URL of the blog + the specific post you want to link to. Right click on the URL (area where the pink arrow is pointing in the photo) and hit "Copy." Note: It is best to link to the specific party URL when you can, but most bloggers are happy with a direct link to the main blog these days. 2. Open your Blogger post editor and scroll to the bottom of your post. B. Click the Link tab at the top of the post editor. 3. To finish the "I'm Linking to" phrase, type in the name of the blog or blog party you are linking to (I think most bloggers would prefer their blog name) where it says "Text to Display," and where it says "Link to" make sure "Web Address" is checked and Right Click then Paste the URL of the host blog/blog party into the box and hit "OK."
If I'm linking my post to more than one party, I just add a comma after the first text link and add the next one in. Or you can make a list of them, bulleted columns, etc. Whatever you want. I've heard some bloggers complain that adding text links is time consuming and clutters up blog posts, but there are good SEO (and etiquette!) reasons for doing it this way, and we'll explore them another time. I've been blogging and linking to blog parties for a long time, and I can tell you that nothing makes a hostess happier than seeing a blogger who reads and follows the guidelines for linking back. Bloggers do a lot of chatting behind the scenes, and we do notice people who take the time to follow rules and make the blogosphere a more gracious space. So please don't think your efforts go unnoticed! Why Should I add a Link Back to my post when I join a blog party? There are several reasons why you should include a link back in your party post, and we'll discuss those in the next series post! I'm taking next week off from the series, but I hope you'll stop back in next time! If you enjoyed this post or found it helpful, I'd love for you to click the "Pin It" button to add this post to Pinterest, or +1 me for Google+. Thanks Amanda! This is the way that I like to link back to parties so I'm glad that it is acceptable to most hostesses. You are right...once you get the "hang of it" it really does NOT take much time to do the courteous thing and link back to the party host blog. Thanks for posting this AManda! I'll make sure to share it on my FB page, I know there are still people there that are afraid to link their projects because they don't know how to link back. Great post Amanda! I think a text link is a great way to link back...buttons for all the different parties can get too busy at the end of a post sometimes. I never thought about linking directly to the party post though. I always just link to the main blog page because that is what I assume most buttons do. Another well-written, timely post, Amanda! As you know, my link party is still small, and I'm trying to build it into a good party. I SO appreciate people who take the time to provide a link! I know that it is time-consuming, but I think it's the most courteous thing to do. There are a few people who have created a nice page with a list of parties to which they often link, and one who actually provides a link to that page in each post--so at least there's a way for her readers to see where she's linked the post. I appreciate that effort, too. As for me, I always try to provide a link right within the post. I think that if I ever get so busy that I don't have the time to provide a link within the post, then I'll know that I'm linking to too many parties! Thanks for this post. I have one question for you. When I link up to a link party and the hostess or host has a button and I put that on my blog, is that the same thing as adding a link back? I always put the button and have thought that it is what I need to do. Now when I read this, I am wondering if I am still missing the mark in what all the wonderful host/hostess want. Thanks for helping clear this up for me. Thank you for posting this, I have been linking to parties for a couple of weeks now and have been doing the buttons. I know it takes time but I have managed to create a link party page and when I need to link I copy the html code of the buttons and whola!!!. But I agree with other posters if linking to too many parties the page can get busy. Might start doing the text version. i think it is so cool that you are always giving us great tips. Your easy-to-follow, step-by-step directions for how to add a link back should be very helpful to many new bloggers. Thanks for posting this, your 'how tos' are always helpful! I just have one question which I hope you can answer! Sometimes when I link up instead of my thumbnail image appearing, a blue frog is there with 'no thumbnail' text! I check the link and know it works, could you shed any information on this? It's actually happened today linking up to your weekend link party! I would love to Pin It, but I just figured out how to tweet...haven't learned to pin yet! Once again, thank you so much for this info. The pictures that you added were perfect for the technology-challenged like ME!! !